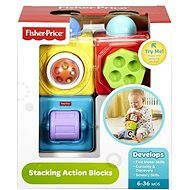 The Fisher Price Active Jigsaw Puzzle (Stack and Roll Cups) will greatly assist your baby in his or her development. It offers plenty of alternatives on how to play with easy-stack cups that can be stacked on top of each, fitted inside each other, or use the numbers on the side to introduce counting, or recognise the different colours of each cup. By combining the cups, the child can even create abstract shapes! The set includes a jingle ball that can be used as a separate toy, put inside one of the cups or placed on top of the whole stack. This engaging toy will assist in developing a babies coordination and will help them to learn basic skills and practice logical thinking. This toy complies with Directive 2009/48/EC of the European Parliament and the Council of 18th June 2009 on the safety of toys and all statutory standards are in accordance with Czech legislation. It also complies with CE requirements. For shipping to other EU countries visit this page Fisher-Price - Active Jigsaw Puzzle with a jingle ball. 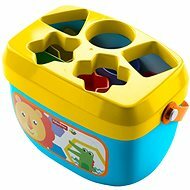 Für Versand nach Deutschland, besuchen Sie bitte Fisher-Price - Aktives Puzzle mit einer Schelle. Chcete doručit zboží do Česka? Prohlédněte si Fisher-Price Aktivní skládačka s rolničkou. Chcete doručiť tovar na Slovensko? 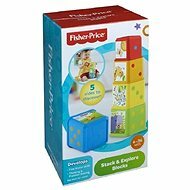 Prezrite si Fisher-Price – Aktívna skladačka so zvončekom. Für Versand nach Österreich, besuchen Sie bitte Fisher-Price - Aktives Puzzle mit einer Schelle. Magyarországra történő kiszállításért tekintse meg ezt a termékoldalt: Fisher Price - Aktív puzzle- harang alakú.